The UK's largest co-operative society has launched a £100m revamp of its brand, introducing a new profit-share dividend scheme for shoppers. The £8bn Co-operative Group will rebrand its chain of more than 3,000 food, funeral, insurance, pharmacy and bank outlets as The co-operative. 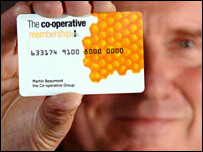 Customers who pay £1 for membership will collect points from buying various co-operative goods and services. The profit-share scheme is a return to the "divi" that ceased 30 years ago. The Co-operative Group is the largest such society in the UK, representing more than 60% of co-operative trade. It was formed from the merger of the two largest societies, the Co-operative Wholesale Society and Co-operative Retail Services, in 2000. Co-operative retailers had a 20% share of the British grocery market in the 1950s, but have lost ground to the supermarket giants and now have a 6% share behind Tesco, Asda, Sainsburys and Morrisons. 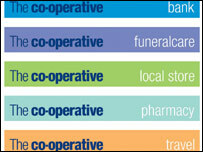 The Co-operative Group remains the UK's biggest commercial farmer, has the largest chain of undertakers and independent travel agents and operates the internet bank Smile. As well as unifying its brand image, the group hopes that the changes will improve consumer awareness of its ethical trading principles, helping to reverse a decline in membership and market share. It wants to increase membership from 600,000 now to four million by 2010. "There are millions of consumers across the UK who share our belief in self-help, social responsibility and democracy and, like us, are prepared to take a stand on consumer and social issues," said Martin Beaumont, the Co-operative Group's chief executive. "At a time when communities are becoming increasingly dominated by a handful of large and impersonal businesses, we want to show UK consumers that there is a better alternative, one which is ultimately owned and controlled by them." Customers earning loyalty points will be able to convert them into a share of Co-operative Group profits, payable each June and December. The value of the points will vary according to profits, but the group said a person spending £10 a week in its food stores might expect to earn £5.20 over the year and someone buying a £2,000 pre-paid funeral could earn £20.